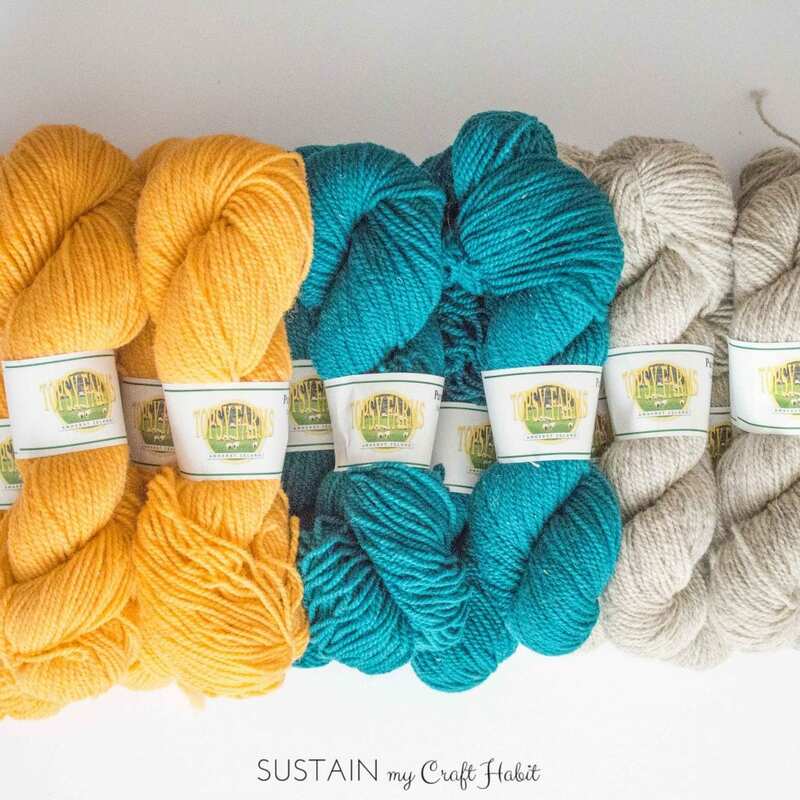 Back when we were selecting our yarn from Topsy Farms, I was immediately drawn to the richness of the Gold Sunflower colour. It’s a very warm, comforting colour that reminded me of a sunrise or actually, more of a sunset over Lake Huron because well let’s face it, I rarely catch a sunrise! Although I didn’t have a project immediately in mind, I knew I wanted to create something with that colour. With 29 gorgeous options to choose from, it was definitely difficult to pick just one for a project. If you’d like to learn more about the many benefits of working with wool, you can read our previous post here. After receiving the yarn, I tried a few different things just to get a feel for knitting with it. Before finally deciding on a light-weight spring shrug, I began to knit a scalloped carpet bag pattern that I absolutely loved! I have to show a picture of it because it’s just too beautiful not too. And although I didn’t end up finishing the carpet bag, I will definitely return to it in the near future. 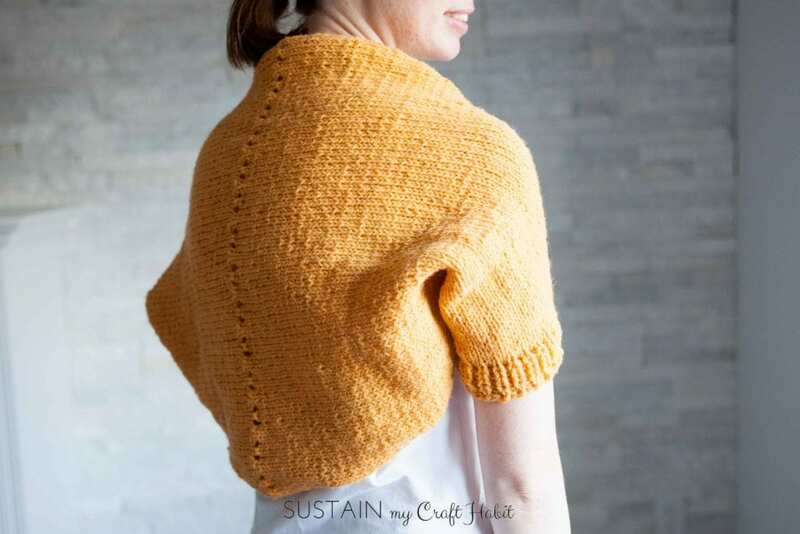 But for now, I am so happy with my cozy, easy to wear, loose fitting shrug that wraps perfectly around the shoulders for those brisk spring or fall nights. We’re very excited to share this new pattern with all of the knitting lovers out there! 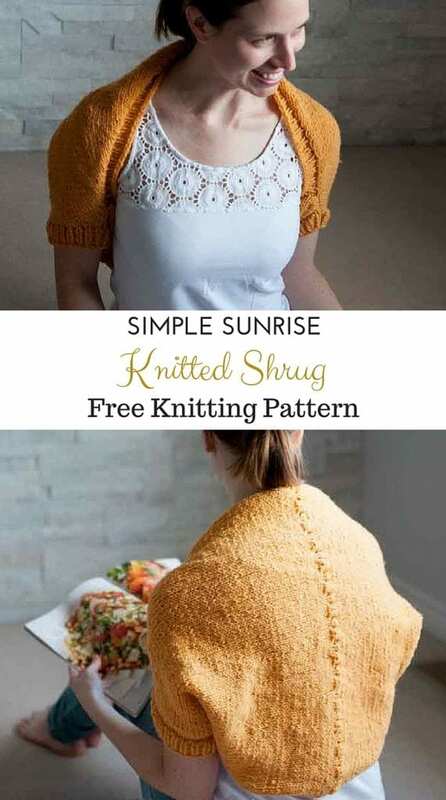 With this pattern, you will create a simple one piece knit shrug with a single lace stitch along the centre back and a fisherman’s ribbed neck band and sleeve cuffs. If you aren’t familiar with the fisherman’s rib knit technique, check out our quick video on YouTube. 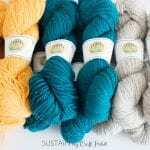 Approximately 300g of medium or worsted weight pure wool yarn. 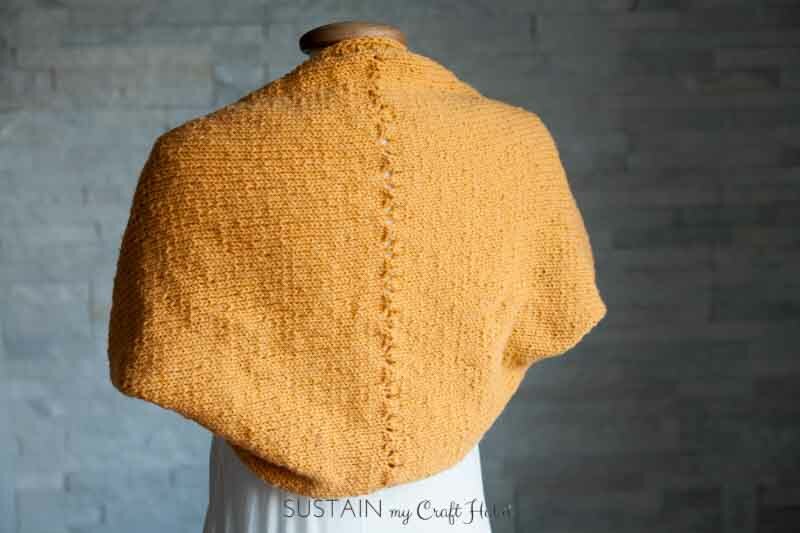 We used Topsy Farms’ Gold Sunflower 2-ply fine wool which comes in generous 100g skeins (double the size of usual wool skeins you may find in the store). If you are in the downtown Toronto area you can also stop by Yarns Untangled, the only Toronto distributor of Topsy Farms yarn. 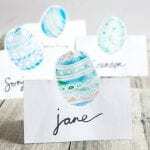 Stitch Marker – these sheep stitch markers on Amazon are pretty adorable! 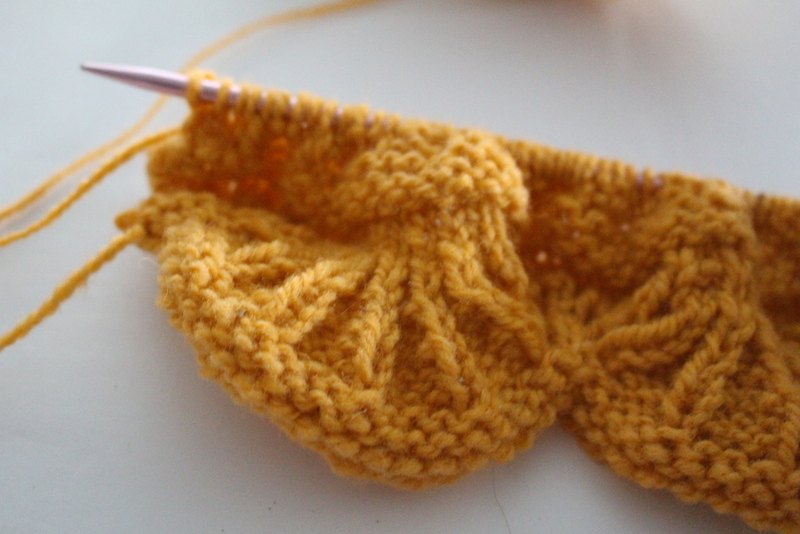 Continue this pattern (Row 1 to Row 4) until you have 84 stitches on your needle. (The center point of the shrug is approximately 17 1/2″ from cast on edge). Continue this pattern (Row 1 to Row 4) until you have 44 stitches on your needle. BO using very stretchy cast off method. 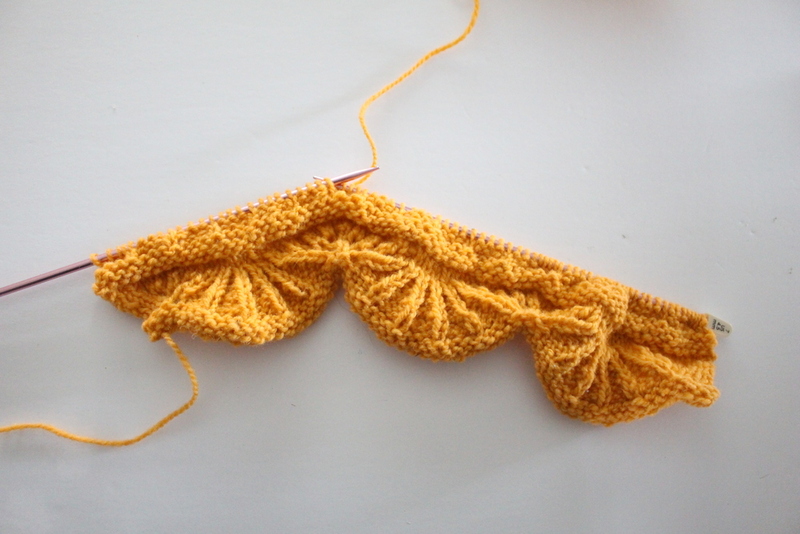 Fold the knitted piece in half lengthwise with RS together and seam up each end approx. 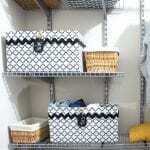 2″ or to achieve a desired fit. 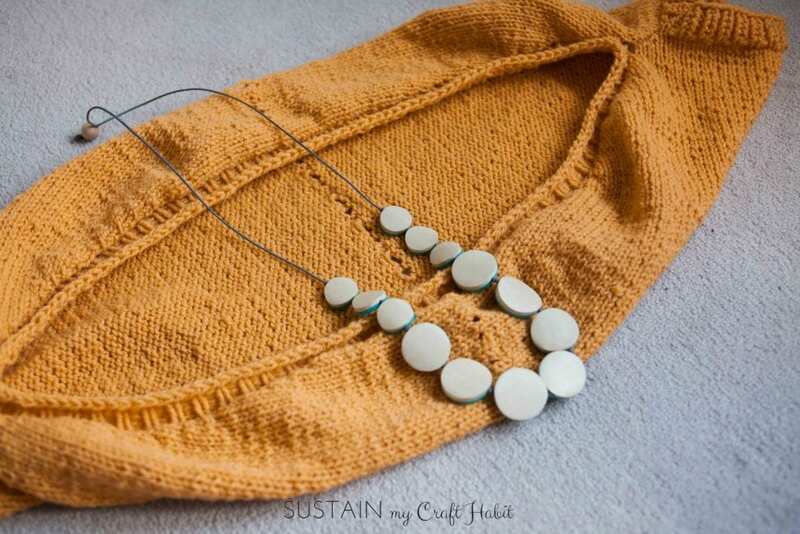 Using your size US7 circular needle, and starting at the right underarm, pick up 2 sts for every three rows all the way around the inside edge of the shrug. The exact number of stitches is not critical but try to pick up an even number of stitches. Place a stitch marker to mark the start of your round. Knit all stitches to the stitch marker. Begin Fisherman’s rib: (P1, K1 stitch from below) repeat to stitch marker. Continue Fisherman’s rib until your ribbing measures 1 ½”. Knit all stitches to stitch marker. Weave in all yarn tails and ENJOY! If you are interested in additional knitting ideas we’ve collected some of the best free scarf knitting patterns on the web. We also have our multi-wear cowl knitting pattern and a beautiful knitted beach cover-up review. 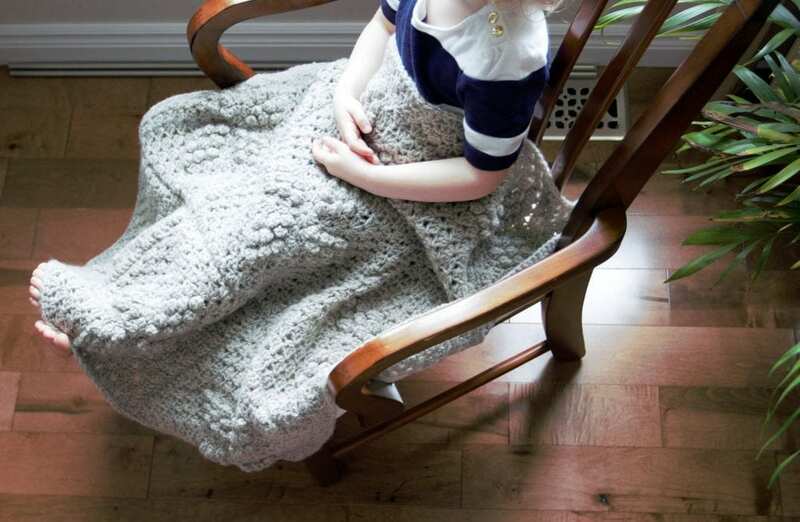 For all you crochet addicts out there, we recently posted a free Sand Pebble Crochet Afghan pattern and crochet coaster pattern for beginners. Check it out! We’d love for you to join our mailing list to receive our weekly fun and inspirational newsletter. Subscribers receive a copy of our e-book “DIY Rustic Decor: 7 Simple Ways to Infuse Nature into Your Home” plus other goodies. Subscribe here. love the yarn! 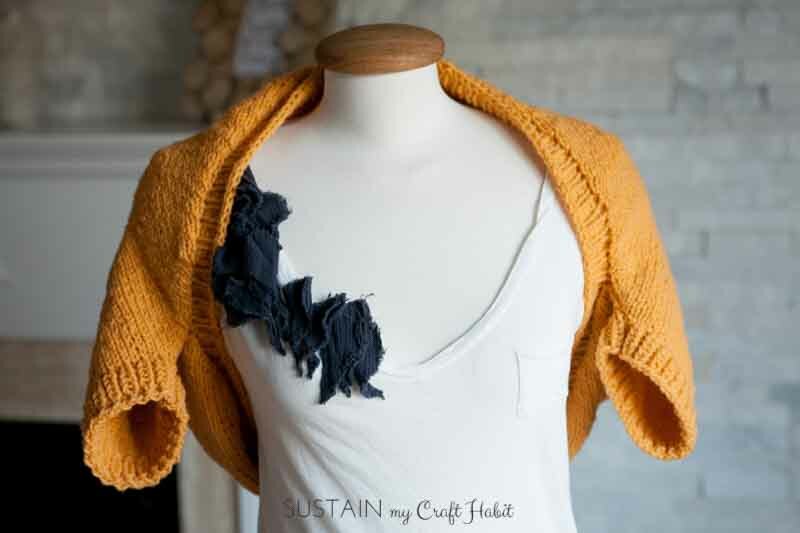 this knitted shrug tuned out so pretty! Thanks for sharing the pattern with us! Thank-you, it is our pleasure to share it! This turned out so great! 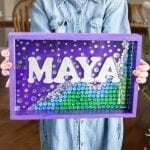 Thank you for sharing – pinning for later! Thank you Charbel. If you do get a chance to make it, we’d love to see a picture. Have a great weekend! I love the color of the yarn, it is so pretty. This would be a great shrug for work, as it sometimes gets chilly, but not enough for a long sleeved sweater! You’re so right Jennifer! With this between-seasons weather the office is always either too warm or too cold. And it really bothers me having too much bulk around my wrists when typing. Thank you so much for stopping by and taking the time to comment! It’s lovely!! And I especially love the weave along the middle line of the back. Thanks, Heather. It’s a simple lace stitch for a simple knitted shrug. Looks absolutely lovely!!!! Seems easy enough to accomplish!!! Thank-you, Camila. It is quite easy to knit up since the majority of the shrug is knitted in a stockinette stitch. Your shrug turned out so well. One thing I’ve always wanted to learn but haven’t gotten around to it is knitting, especially when I see projects like this one! Thank-you, Shauna. It’s never to late to learn! I love to relax by kniting at the end of the night. It’s one of those hobbies that you can do when you don’t have the energy to do much else! I love this, so cozy and a perfect little extra layer for our crazy Canadian weather. I need to share this pattern with someone who will knit for me… I’m SO challenged! Very impressed by your talent! Yes, exactly! With the temperature fluctuating from negatives to double digits from one day to the next, we all need to dress in layers! I am trying to begin the lace weave row down the middle of back and the stitch count is ending up at only 81 (3 sts to begin and a repeat pattern of 5 sts fifteen times ending with knit 3) for a row of 84 stitches. What is to be done with the extra 3 sts?